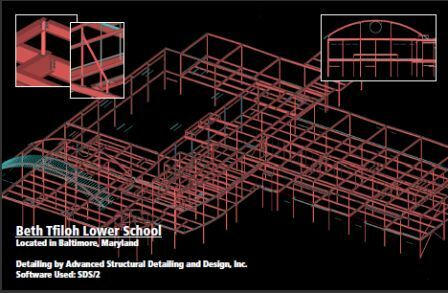 ASDD provides structural steel detailing services, as well as checking, engineering, and consulting services. We work with architectural firms, engineers, steel fabricators, and builders throughout the Eastern Seaboard. We pride ourselves on getting all drawings and details on paper correctly, promptly, and reliably, helping our clients avoid costly re-fabrication of steel in the field during erection and installation. The use of extremely powerful and productive detailing tools – cutting edge SDS/2 software by Design Data – allows us to offer superior service and accuracy while increasing efficiency and ensuring success. Beth Tfiloh Lower School - Design by ASDD, Inc.